Viu (pronounced View), is a legal streaming service of Korean Dramas that recently started being made available in Malaysia. It is a service provided by Hong Kong’s largest telecommunications company, PCCW. Unlike other popular streaming services available locally like Netflix and iflix, Viu will be using a freemium model. All contents are free to access, but are subjected to pre-roll advertisements. Of course, other than Korean Dramas and variety shows, there's also a mix of Japanese dramas and animation, as well as Chinese and Taiwanese dramas. All the latest shows would be made available on Viu merely eight hours after they air on TV at their respective countries. Viewers will also have the option to enable subtitles in English or Chinese. They can choose to download the videos to be watched later too! Viu Premium, where you get to enjoy ad-free streaming experience, as well as access to premium videos, costs RM10 per month to subscribe. 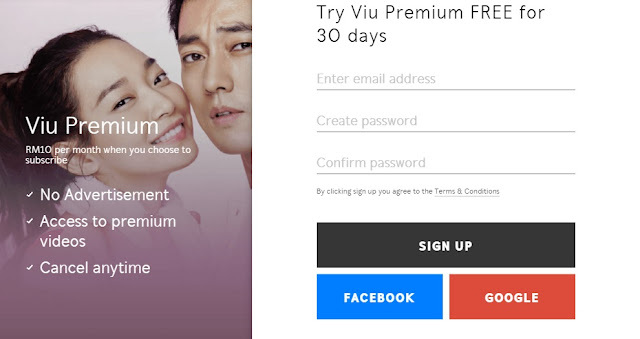 There is a 30-day trial for users to try out Viu Premium for FREE when you sign up directly via their website. However, to sweeten the deal, here's your chance to get up to 3 Months of FREE Viu Premium subscription! Just click HERE to get your 3-month Free Viu Premium subscription! Viu contents can be accessed via its website, iOS and Android smartphone apps.